We in Wisconsin are getting fed up with the winter season, at least my family is. Dirty snow, filthy exterior of cars, and just darn frigid temperatures. It’s not letting up, but with that said, that always lends its way in making comforting dishes like chili, and that is never a bad thing. I have my go to recipe for making a delicious bowl of chili, however this time around I wanted to spice things up and use a Mexican chorizo in the chili. My idea was to use chorizo to give it that little kick of heat, and also some texture, not only that but I wanted to see if my wife would notice as she was never a big fan of chorizo, like I am. I do love using chorizo. This chili had the perfect amount of heat, and although my wife thought it was too spicy, I though it was really well balanced and was a great way to incorporate chorizo into the chili. Begin by heating a large pot on medium-high heat. Add in the oil and let it come to temperature. Add in the stew meat, and cook until you get a nice brown crust on the exterior, on all sides. Once browned, remove from the skillet and set aside on a plate. To the same pot, add the chorizo, and using a wooden spoon, begin to smash it down, while at the same time scraping the brown bits. Cook the chorizo, then use a cover, and strain the majority of the oil. Reserve about a tablespoon of the chorizo oil. Toss in the celery, onion, and garlic, along with the cumin, and a generous pinch of salt and pepper. Stir, and cook on medium high heat for a few minutes. Toss in the browned stew meat, and give another stir, cooking for a couple more minutes. Next toss in the canned tomatoes, beans, and water. Stir. Bring to a boil, then reduce heat to low, cover, and cook for about one hour. 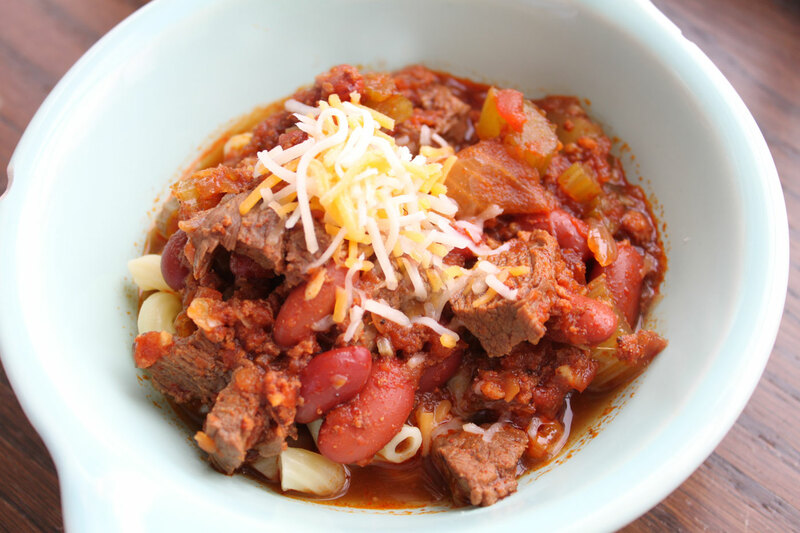 When you are ready to serve, add some cooked noodles to a bowl, and ladle in the chorizo chili. Top with some shredded cheese, or your favorite chili toppings such as sour cream, crackers, fritos, raw onion, or heck even some diced avocado. 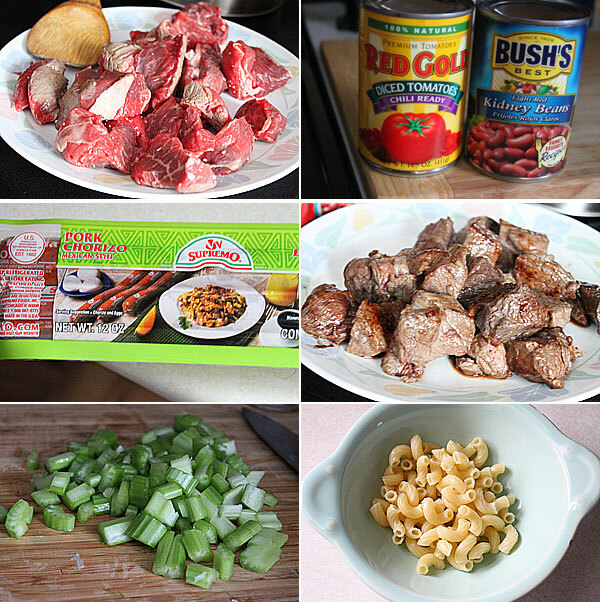 The end result is a well textured chili that has a nice heat, which I love, and some good tender beef when paired with the beans and celery, well, it makes for a great chili. This would also go really well as a sloppy joe sort of thing if straining some of the liquid, or go perfect on a hot dog. So if you are looking for a new idea in making chili, give this one a shot. It was great. I hope you enjoy.